Only a couple of weeks late on this one! It's no secret that I love the Fast & Furious franchise. (Yes, even Tokyo Drift, although love might be a little strong in its case.) And I've been excited to watch Furious 7, since seeing the end of Fast & Furious 6—which promised even more ridiculous action with the addition of Jason Statham. But then, Paul Walker died, and it made me want premiere day to come a little slower. Paul was a driving force behind the franchise, and I was dreading seeing his "last ride." That said, when the day did come, I was super excited. And the movie did not disappoint. It's full of over-the-top action sequences, laws-of-physics-defying fight scenes, and a host of great one-liners. As I suspected, Jason Statham is an amazing addition to an already stellar cast. I laughed, and I laughed. And then, at the end, I cried. 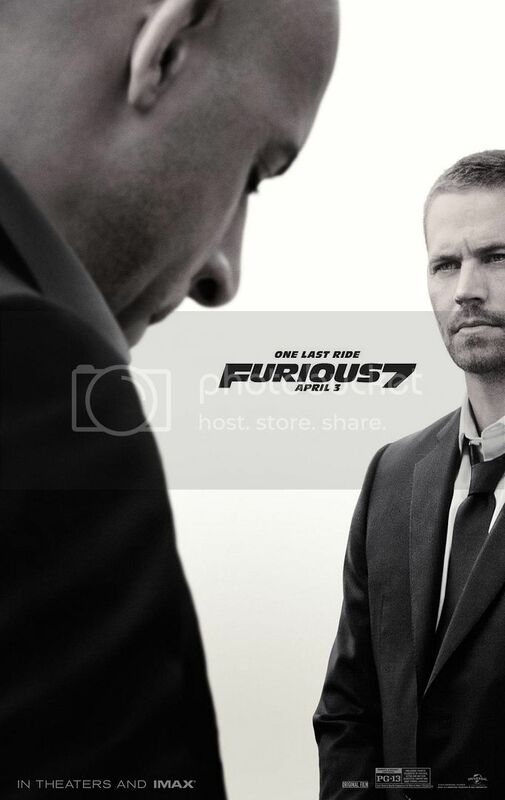 I won't say why, so at to not spoil it for those who haven't seen it, but it's a fitting tribute to Paul. Sad, but good, if that makes sense? The movie also does a great job of tying Tokyo Drift, previously the outlier of the series, into the rest of the series. (If you haven't watched any of the movies, I'd suggest watching them in this order: 1, 2, 4, 5, 6, 3, 7.) But it's a little laughable, and not in a good way, seeing a scene with Lucas Black from Tokyo Drift juxtaposed with one of him a decade later that viewers are supposed to believe happened mere hours apart. If you're a fan of the franchise, or just really like action movies, this is a film you definitely need to see. I'm not as late with this review as the other two I posted earlier this week—only about a month and a half after seeing it rather than more than two. This movie is still in some theaters! To be honest, I didn't really care to see this movie in theaters. I liked Divergent, the first movie in this series, well enough—I gave it ***1/2 stars in my review—but I liked Divergent, the book, much more than the others in the series, so I figured the movies would go downhill equally. 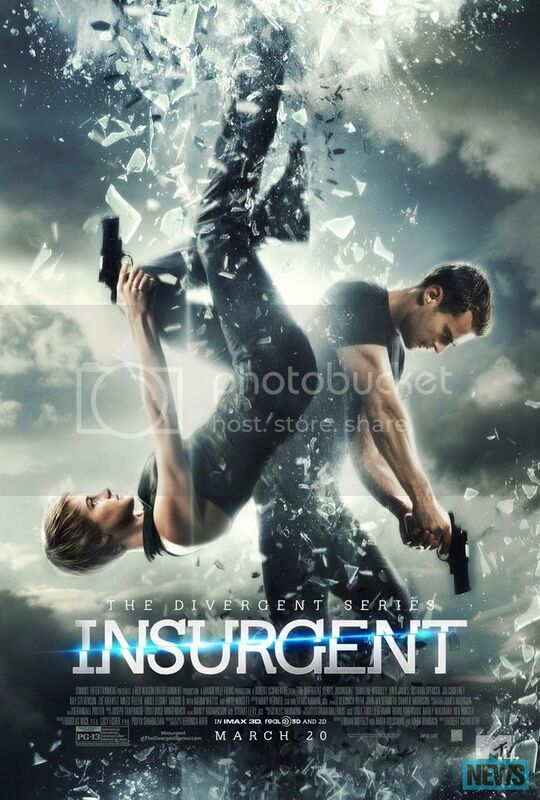 I was sort of right in that assumption; Insurgent is pretty ridiculous, and, for the most part, not in a good way. 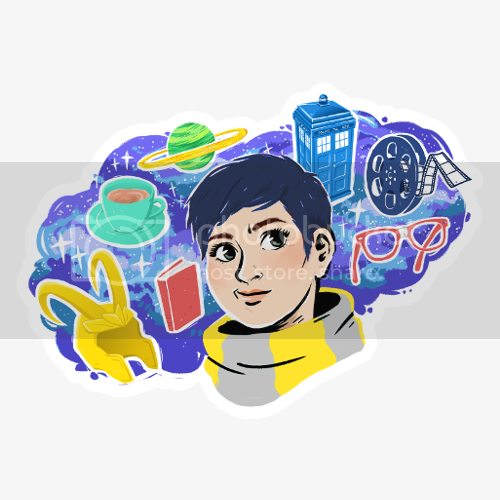 I saw the movie with ladies from my book club, and thank goodness they were there, because I would have felt bad laughing at some of the supposedly more serious moments if no one else was. These movies just try so hard to be something they're not, and even with the changes between the film and the book, which, I'm sure, were meant to make this more appealing to the movie-going masses, there's something missing. Even the great actors in the movie—Maggie Q, Kate Winslet, Octavia Spencer—had little to work with. Shailene Woodley's Tris is just plain terrible, and the various states of her hairdo throughout the movie are massively distracting. Miles Teller's sassy Peter is a shining light, but his quips only do so much. Then there's the end of the movie, which feels oddly final. How there are going to be two more movies in this franchise, I do not understand. If you're a series completist, by all means check this one out. It's good for a laugh, at least! Viago, Deacon, and Vladislav are vampires who are finding that modern life has them struggling with the mundane—like paying rent, keeping up with the chore wheel, trying to get into nightclubs, and overcoming flatmate conflicts. This review is very late—it's been about two months since I saw this movie. But it might help you decide if you want to watch it when it becomes available on demand/on Netflix/at a Redbox? 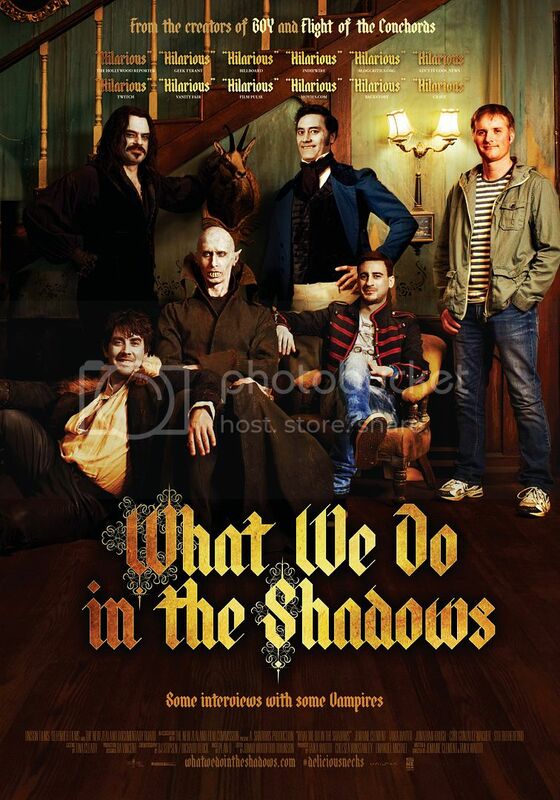 Although I loved the premise of this movie—A bunch of hapless vampires dealing with the modern world? Yes, please!—the actual movie left a lot to be desired. Many of the best jokes of the movie are in the trailer (heads up, those of you who were about to watch it below), and even they aren't all that funny. The humor is similar to that of Flight of the Concords, and fans of that show will recognize quite a few people in the film, but it never quite made me laugh more than a chuckle. And if you know me, I laugh loud and freely when I find something amusing. That said, I really enjoyed the sets and some of the silly special effects. Maybe I just wasn't in the right mindset for this kind of humor? I'd recommend adding this to your Netflix queue—I wouldn't spend money on it (again)—if you're a FotC fan. This review is very late—two months to the day that I actually saw this movie. But it might help you decide if you want to watch it when it becomes available on demand/on Netflix/at a Redbox? I was excited to see this movie before it came out, thanks in part to the combination of Colin Firth and Matthew Vaughn (who's had a hand in movies such as X-Men: First Class and X-Men: Days of Future Past). Colin is, well, Colin—how can you not love the man who's played roles such as Mr. Darcy, Mark Darcy and Jaime (Love Actually)—and Matthew Vaughn has a great track record of doing comics justice on the big screen. Also: How has Colin Firth never been in an action movie? He was absolutely delightful as the James Bond-ish Harry Hart. Taron Edgerton, who plays the movie's "unrefined, but promising street kid" recruit, also does a fabulous job. I see big things in his future. I've never read the comics that this movie is based on, but the idea of a secret British government agency who use fancy gadgets and are impeccably trained is a fun one, if not completely unique. But this isn't your typical James Bond story; it's much less serious and much more ridiculous—particularly the fight scenes. As someone who gets a huge kick out of over-the-top action scenes, however, the ridiculousness is a major pro rather than a con. There's one major flaw to the movie that left a bit of a bad taste in my mouth, and that's an uncomfortable sexual encounter that happens near the end. I'm sure it was meant as an edgy nod to the idea of Bond Girls, but it just seemed crass and out of place in an otherwise fun movie. 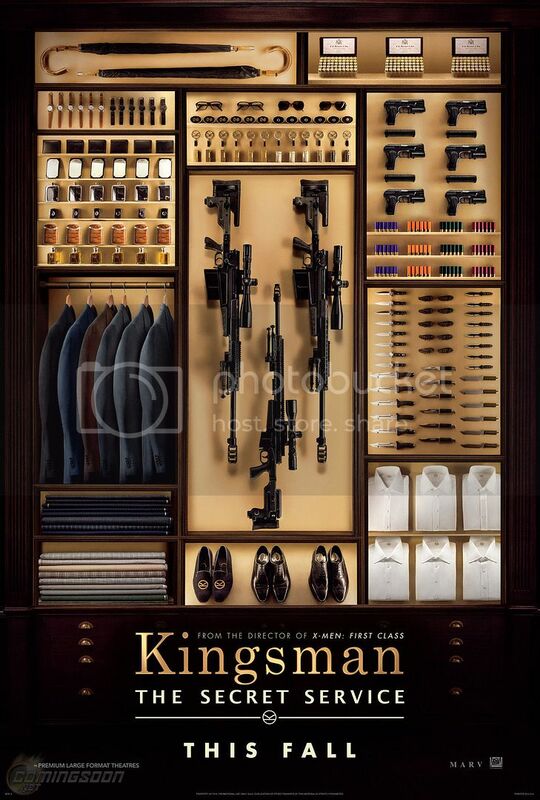 Still, I'd recommend Kingsman to anyone who enjoys comic adaptations/action movies. Just don't bring the (young) kids. I still have some reservations about this reboot, but I have to admit that this trailer is pretty dang awesome. This trailer is also great. But as much as I love the Jurassic Park movies, the fact that no one in these movies takes a look at the past and thinks, "maybe we shouldn't mess with dinosaurs" has my common sense screaming for mercy. It's a good thing my common sense has a mute button (see also: Fast and Furious). Although I'm still a little put out about the "erasure" of the extended universe that happened when Disney bought Star Wars, I'm definitely excited for more Star Wars movies, both involving the core characters we know and love and those—I'm assuming—we'll grow to love after we get to know them. ICYMI: A new Star Wars: The Force Awakens trailer was released last week. The Internet (at least the corner of it that I follow on Twitter) is currently going insane. And I can't blame them. I—no joke—started crying at the end <SPOILER>when Han and Chewie showed up</SPOILER>. I CANNOT EVEN. I now have so much more* respect for Joss Whedon. How any of these ridiculous(ly awesome) people get any real work done, ever, is beyond me. *I already had a ton, natch.